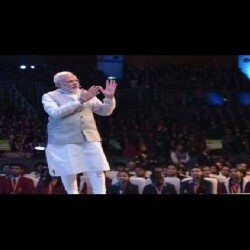 Pariksha Pe Charcha 2.0 programme 2019 updates: Prime Minister Narendra Modi interacted with school children during ‘Pariksha Pe Charcha 2.0’ programme 2019 in the national capital on Tuesday. The interactive session with the PM Modi was held at the Talkatora Stadium. Following are the highlights of PM Modi’s speech during the ‘Pariksha Pe Charcha 2.0’. Parents must try to recognise the potential in their children. As far as expectations are concerned, we also feel like working hard when there are expectations. Technology can be instrumental in connecting parents and children. Parents should slowly teach children to use technology in the right manner. Then children will leave PlayStation for a playground. Technology must be used to increase our capabilities. George Fernandes passed away today. He was a dynamic leader. He fought the Emergency tooth and nail. I pay tribute to him. During the second edition of ‘Pariksha Par Charcha 2.0’, PM Modi discussed ways to handle the exam stress. Highlighting examination-related stress, a short film by the Education Ministry was also screened during the interactive session. The participants also include college students from 24 states and Union Territories.